What originated in 1902 as a single hospital serving its neighbors has today grown into an expansive healthcare system that touches the lives of individuals throughout Ventura County, California and beyond. Community Memorial Health System, established in 2005 when Community Memorial Hospital in Ventura merged with Ojai Valley Community Hospital, is comprised of these two hospitals along with family-practice health centers serving various communities within Ventura County. Our health system is a community-owned, not-for-profit organization. As such, we are not backed by a corporate or government entity, nor do we answer to shareholders. Rather, we depend on – and answer to – the communities we serve. To Heal, Comfort and Promote Health for the Communities We Serve. Integrity, Service, Excellence, Caring and Transparency. 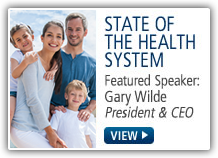 To be the regional integrated health system of choice for patients, physicians, payers and employees. To be an indispensable community treasure.